Thus had events twisted and turned that the company now found themselves at the foot of Amon Naugrim, a steep hill in a naked patch of land just south of the Men-i-Naugrim, the old Dwarrow road running across the waist of Mirkwood. A grass-ridden patch of open land, with the ruined walls of an old inn nearest to the entrance from the old forest road, and a steep hill at the farthest end crowned by the remains of a watchtower. Scarred and partially ruined, the old Dwarven watchtower stood still in defiance of both time and shadow, a testament to the craftsmanship of the Dwarves of old. The company found now some rest from their travels and travails. In the early morning dawn, alarming the company at first, a silhouette appeared at the brink of the forest. "And what errand has driven you to this place? What purpose drives you thus across Mirkwood the dark?" The voice was that of Galion Haradion, the elf, whose scouts Agmund, Javelin and Haggol had encountered on the edge of The Long Marshes while searching for Balin's lost company. Now Balin, who had otherwise been quiet for a good part of the journey spoke up, "It is of no concern to drunken, dainty elves who stalk weary travelers in the dark!" Followed by some horrid sounding Dwarfish curse. Slightly stunned, and not entirely aware of the history between Balin, who had been captive in King Thranduil's dungeons, and Galion, the former right-hand of Thranduil, who had aided the Dwarves and Bilbo's escape from the Elven halls by being drunk while on watch, the rest of the company were reticent to step into the feud. Finally Agmund, Barding of Dale, son of Arnulf stepped forward, pleading for help with a now enraged Galion. "Verily our wish is to leave these woods as fast as can be done, yet we were waylaid here by a host of orcs..."
"I know of these orcs you speak of, we have seen their host." "Then you know our danger; will you not help us?" Balin interjected himself again, "I would not expect an Elf to help his own kin, let alone those more deserving. Who knows how many more of his kind are hiding in the forest, with their bows trained at our very hearts?" As Balin retired from the conversation, another elf stepped out into the dim dawn, Anarië Gelarioth. They spoke together in a language none of the company could understand, beautiful though it was. Agmund tried again, "what ails Balin I know not, but our peril here is great, and as you lay claim to this forest, it would only be in your own service to aid us against the orcs that march on us." "The forest is lost, Thranduil lays no claim to these broken lands. I won't lay down our lives for those of mortals whose lives are forfeit in time regardless." Anarië saw to The Javelin's wound, earned in the fight against the Orc scouts, and turned to talk with Galion. Despite his obvious annoyance, she disappeared again into the forest, only to return shortly thereafter with healing herbs, which she helped apply to the wound. A deep singing now came from the hill, where Balin stood. The elves turned now back into the forest, Anarië stealing one last look at the still-wounded Javelin, a deep sadness in her eyes. And with that, the company was once again alone. Undeterred, they set about planning for the inevitable battle, walking the terrain and strategizing about traps and hindrances. Balin, experienced in the affairs of war and combat laid out a range of clever traps that would lead the orcs from one to another, felling them as they went, hopefully. While the rest of the company, including even the most often quiet Barrak, digged holes and prepared for the coming night, Javelin rested to regains his strength, and perhaps his throwing arm. As the darkness once again enveloped the world, the company settled into their positions, the dwarves Balin, Barrak and Haggol on the hill around a fire, Javelin and the archer Agmund in the ruins of the inn. As a deep quiet fell on the forest, the hardship of the past days fell on the group. 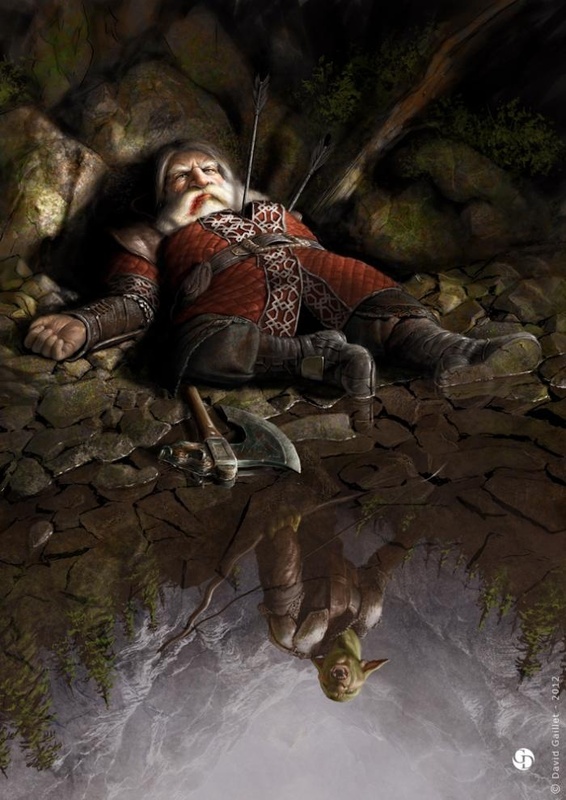 Haggol saw in his sleep Balin standing over a body of water, above him an orc drew his bow, and an arrow felled Balin where he stood. Agmund awoke. He had fallen asleep. He turned to wake up Javelin, who had fallen asleep as well, but no sooner did he see a shadow pass hole where once a door had stood in the inn, and heard a deep snarl. "Orc!" he shouted at the top of his lungs, and lunged into an attack. The company sprung into action. Javelin and Agmund felled two orcs and ran back towards the hilltop, but the day-long rains had turned the ground into slippery mud and Agmund fell. Balin came quickly to his defence from the encroaching band of orcs appearing up from the road, their roars and shouts filling the silence as thunder roared across the vast forest. Javelin finally earned his name as his spears fell with uncanny precision into the flesh of the orcs. Agmund now safe joined the fray with his dagger (of all things) as did Haggol and Barrak. Balin raised his axe and sang at the top of his lungs. At the sight of Balin's frightful battle cry, the tide of the struggle seemed to turn. Now it became a slaughter, and the company ran them down and spilled their blood in the muddy undergrowth. Catching their breath under the relentless waters of the thunderstorm, the company soon gathered that this was merely another scouting band, and that the night would not yet yield for day.